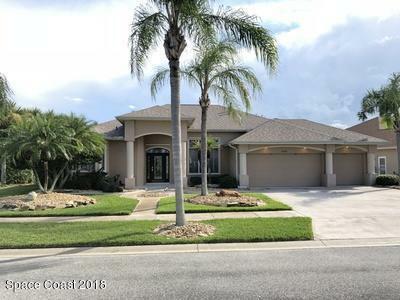 Fabulous lakefront 3/2 & a 1/2 bath pool home located in the prestigious Viera East Golf Community. This split floor plan offers tile flooring in the living areas, a formal dining room, living room & breakfast nook. Beautiful granite countertops have recently been installed in this fantastic open concept chef's kitchen featuring sophisticated custom cabinetry, a built-in desk, cooking island, pantry & a breakfast bar overlooking the family room with a picture window & peaceful lake views. The gracious master suite boasts a sitting area, tray ceilings, his & hers walk in closets, French doors leading out to the Lanai & pool area & a luxurious master bath with walk in shower, garden tub & his/hers custom vanities. A resort style pool, Jacuzzi & Tiki Bar overlook the lake SEE MORE!